They're a matter of some debate here on HerKentucky, but I simply adore them. The ingredients? I mean, it's turkey, bacon, cheese and tomatoes. What's not to love? And then, there's the story of the hot brown. I have to say, it rekindles my Scott and Zelda obsessions when I hear that Louisville's famous Brown Hotel first served the filling, warm, open-faced sandwich as a midnight meal for Jazz Age flappers and their beaux, providing the fuel by which they could Charleston the night away. Good Lord, it just makes me smile to type that. Joan Crawford in Our Dancing Daughters. 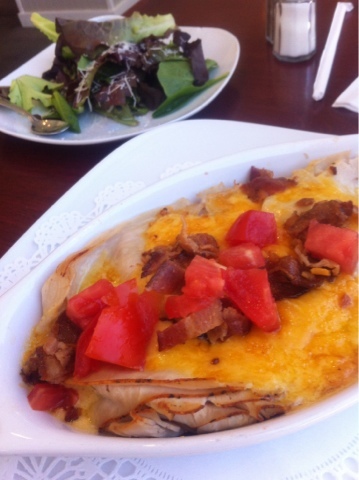 These days, hot brown is one of those quintessentially regional cuisines that you just have to try if you visit an area. Visitors to Central Kentucky just have to try a hot brown. And those of us who live here, well,we either love them or we hate them. Now, I've tried appetizer hot browns and breakfast hot browns. I've had the eponymous sandwich from the Brown Hotel (always my favorite! ), and I've followed their recipe to make my own. But, this weekend, I found a whole new adjective to describe the hot brown: "light." The Cheddar Box Too! is located in the Chenowith Square shopping center in Louisville's St. Matthews neighborhood. It's a delightful little lunch nook -- a spinoff of one of those old-school delis that sells delicious pimiento cheeses, salads and baked goods. The hot brown was light and delicious, with farm-fresh tomatoes and a light hand on the mornay sauce. I had a side of baby field greens with house-made cherry balsamic vinaigrette, which made the meal decidedly more "ladies who lunch" than "flapper." I guess I'll put my Roaring Twenties daydreams aside for another day, but this was a really great sandwich. Who serves your favorite hot brown? In "1920s", "brown hotel", "flappers", "food", "hot brown", "restaurants"